Cornelius Jansen: a leader in the Mennonite emigration from Russia to the prairie states in 1873; born at Tiegenhof, West Prussia, on 2 July 1822, the son of Daniel Janzen (b. ca. 1795) and Anna (Buhler) Janzen (20 July 1797, Petershagenfeld, West Prussia - ca. 1832). Cornelius married Helena von Riesen (1 December 1822, Danzig-Schidlitz, West Prussia - 2 December 1897, Beatrice, Nebraska, USA), daughter of Peter von Riesen (1779-1847) and Margaretha (Harder) von Riesen (1796-1837), on 4 May 1848 in Danzig-Schidlitz, West Prussia. Cornelius and Helena had six children: Margaretha, Peter, Anna, Johannes, Helena, and Cornelius. Cornelius Jansen died on 14 December 1894 at his home in Beatrice and was buried in the nearby Mennonite cemetery. Cornelius lost his mother at the age of ten, and then lived with his uncle Gerhard Penner, elder of the Heubuden congregation, who helped him in his training as a merchant. He was baptized at Tiegenhof. Cornelius married Helena in 1848 and in 1850 the family immigrated to Berdyansk, Russia, returned to Schidlitz, a suburb of Danzig, in 1852, and went back to Berdyansk in 1856. Cornelius worked as a grain broker, shipping grain to England, and served as "the founder and for many years the representative of the Prussian and Mecklenburg Consulate" at Berdyansk. Through his English connections, Jansen introduced English reaping and threshing machinery to the Russian Mennonites who were supplying grain to him. Jansen and his family spent time with the British Consul at Berdyansk, and he and his children were able to learn English. Jansen preferred Russia to Prussia because of Russia's greater economic and social freedom, but he distrusted the Russian government and chose to retain his Prussian citizenship. In the early 1870s when the Mennonites felt their way of life threatened by the new conscription law, Jansen was a tireless leader in the move of immigration to America, and was consequently banished from Russia on 26 May 1873. After visiting friends in Prussia and Quakers in England, he with his family arrived at Berlin (now Kitchener), Ontario, on 13 August 1873. They moved to Mount Pleasant, Iowa, in 1874, and then to their permanent home in Beatrice, Nebraska, in 1876. Here they joined the church founded by the immigrants from Russia under Elder Andreas. In the United States Cornelius Jansen and his son Peter continued their work in behalf of the brotherhood by petitioning the United States government for permission to settle the Russian Mennonites in compact groups and by helping the immigrants find new homes. He also influenced his Quaker friends to give financial aid to the poorer settlers. He was also an active crusader for temperance both in Europe and America. His published works (pamphlets) were: Sammlung von Notizen über America (Danzig, 1872), Gedanken englischer und deutscher Friedensfreunde, Gedanlten über die Pflichten der Christen, Gedanken über den indirekten Militärdienst, Ausschluss der American Paper als gegen Krieg zeugend, Gedanken über Religionsfreiheit. All were published at the author's expense by the printer Paul Thieme at Danzig, the first in April 1872, the others in August 1872. In 1873 appeared Adressen an die Christenheit, Edwin Groening, printer. Pamphlets three and four were also translated into English. At the time of his death, some 112 letters and telegrams received by the family at this time indicated what he meant to his neighbors, friends, and the Mennonites whom he had helped. Through his deep convictions he became the Moses who led his people from Prussia and Russia to the "promised land" and inaugurated a migration movement to North America in magnitude far beyond his anticipation. Cornelius Jansen Collection. Mennonite Library and Archives, North Newton, Kansas. GRANDMA (The Genealogical Registry and Database of Mennonite Ancestry) Database, 16-11 ed. Fresno, CA: " California Mennonite Historical Society, 2016: #3612. Krahn, Cornelius, ed. From the Steppes to the Prairies. Newton, 1949. Leibbrandt, Georg. "Emigration of the German Mennonites from Russia to the United States and Canada in 1873-1880." Mennonite Quarterly Review 6 (October 1932): 205-226 and 7 (January 1933): 5-41. Memoirs of Peter Jansen. Beatrice, Neb., 1921. Reimer, Gustav E. and G. R. Gaeddert. Exiled by the Czar: Cornelius Jansen and the Great Mennonite Migration 1874. Newton, 1956. Smith, C. Henry. The Coming of the Russian Mennonites. Berne, Ind., 1927. Weaver, Chester. "Character Sketch: Cornelius Jansen." Anabaptist Voice: Championing a Faith That Works. Issue 3 (Fall 2016): 20-23. Gaeddert, Gustav R. "Jansen, Cornelius (1822-1894)." Global Anabaptist Mennonite Encyclopedia Online. 1957. Web. 20 Apr 2019. http://gameo.org/index.php?title=Jansen,_Cornelius_(1822-1894)&oldid=143620. Gaeddert, Gustav R. (1957). 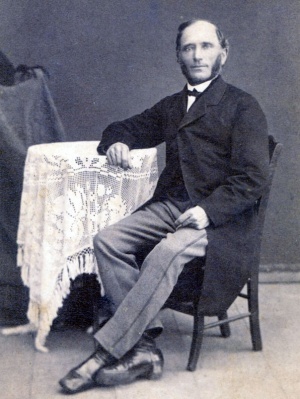 Jansen, Cornelius (1822-1894). Global Anabaptist Mennonite Encyclopedia Online. Retrieved 20 April 2019, from http://gameo.org/index.php?title=Jansen,_Cornelius_(1822-1894)&oldid=143620. Adapted by permission of Herald Press, Harrisonburg, Virginia, from Mennonite Encyclopedia, Vol. 3, pp. 91-92; vol. 4, p. 1146. All rights reserved.